Have you broken your favourite necklace or bracelet? We can get it back to its original condition. It’s always best to use a professional for restringing broken pearl and bead chains to ensure the best result. 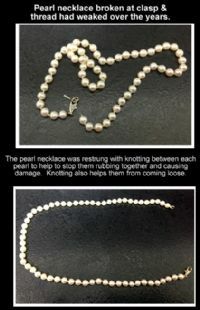 We’re the pearl knotting experts and can restring pearls and beads if your bracelet or necklace is broken. Whether it’s pearl, gemstone, glass beads, amber or jet, you can count on us to restring your necklace or bracelet. The service is fast and affordable, and we always take the upmost care to ensure your treasured jewellery is looked after and beautifully restored.